When asked which are the most intelligent animals (besides humans), most people agreeably state the obvious – chimpanzees. Stating the obvious closes the doors to further exploration, curiosity and education, which is a shame since a large portion of the world’s most intelligent creatures live in the sea. Luckily, there are scientists and zoologists who have taken it upon themselves to prove that the ocean is home to some of the brightest and most adaptable creatures on Earth. Below is a surprising (and not so surprising) list of marine animals that will make you question exactly how they think, feel and interact with others. Here may be a surprising one to many, octopi are rather intelligent creatures – so much so that they are able use tools and open bottles! On top of this already remarkable feat, scientists have carefully observed them in a controlled environment and noticed that they’re able to recognise geometric shapes, and solve intricate puzzles and mazes. In nature, octopi usually travel incognito and prefer to be alone so as to avoid being exposed to predators by fellow travellers who might give them away. There is no such thing as dumb luck when it comes to these smart creatures. Though they may sound cute, left alone to their own devices, they can stir up quite a bit of trouble! In an aquarium in the US, one octopus caused quite a disturbance when it opened a neighbouring tank and snuck in where it wasn’t allowed. Besides being measured on an intellectual level, researchers have observed that they also display signs of playfulness and personality. Killer whales are known to swim together in pods. In each pod or society, there is a distinct dialect and way of life – each different to the next, which is passed down through generations; similarly to how humans have different cultures and language. Killer whales are known to have the second largest brains out mammals – but rarely is brain mass an indicator of intelligence. What indicates the intelligence of these mighty swimmers are their specialised methods of hunting which are deliberately taught to the young or learned by imitating one another. Through years of research, scientists have noticed that killer whales display characteristics of playfulness, curiosity and are able to solve problems. What was further discovered in research studios were that killer whales showed capacity for understanding symbolic language, memory retention and visual perspective. They’re also known for using visual communication where various forms of body language are portrayed through spy hopping and lob tailing. Spy hopping is when the whale holds its head slightly above water to inspect the environment around it. Lob tailing happens when it thrashes its tail against the water with its fin, in order to grab the attention or to alert others to possible danger. These noisy critters have been deemed so intelligent by US marine researchers that they’re now part of a marine mammal programme where they may be called upon for duty! The focus of the programme is to train the sea lions to defend ships and harbours, detect mines and recover lost equipment that may have sunk to the bottom of the ocean. One such famous sea lion is Rio, who was easily trained to perform various tasks. Sea lions have an amazing ability to understand basic syntax and commands when taught by using an artificial sign language. Some marine experts maintain that dolphins have the greatest intelligence of all sea animals. Their ability to form well-coordinated hunting packs, understand sophisticated comprehension and abstract concepts can rival no other living creature other than a human being. 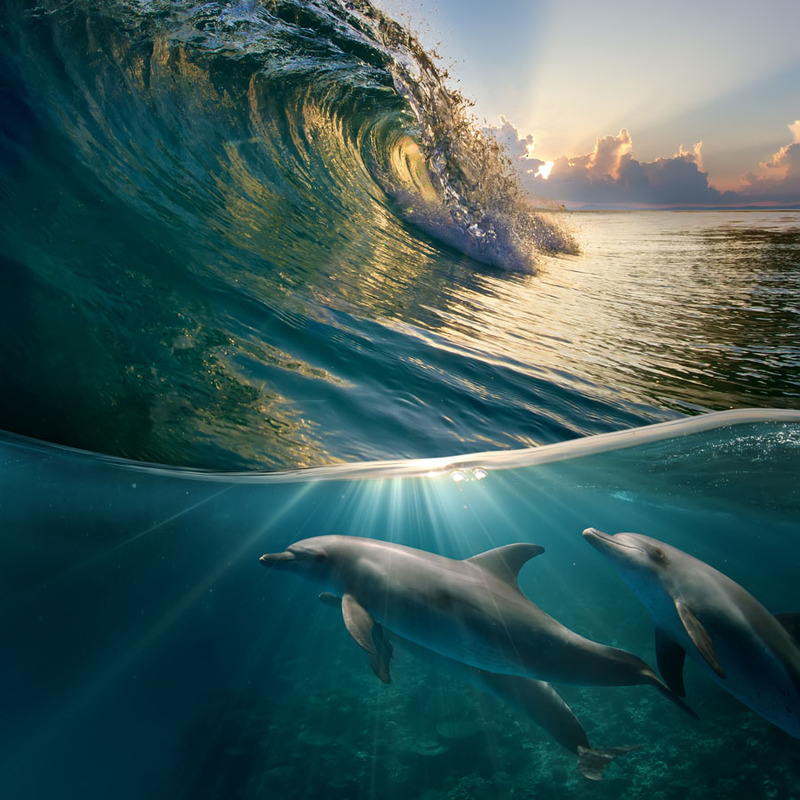 The dolphin’s brain is the second most powerful – which gives them an amazing ability to remember events, learn different concepts and change their behaviour from past experiences. What’s even more fascinating is that they are able to recognise themselves in a mirror due to their high level of self-awareness. 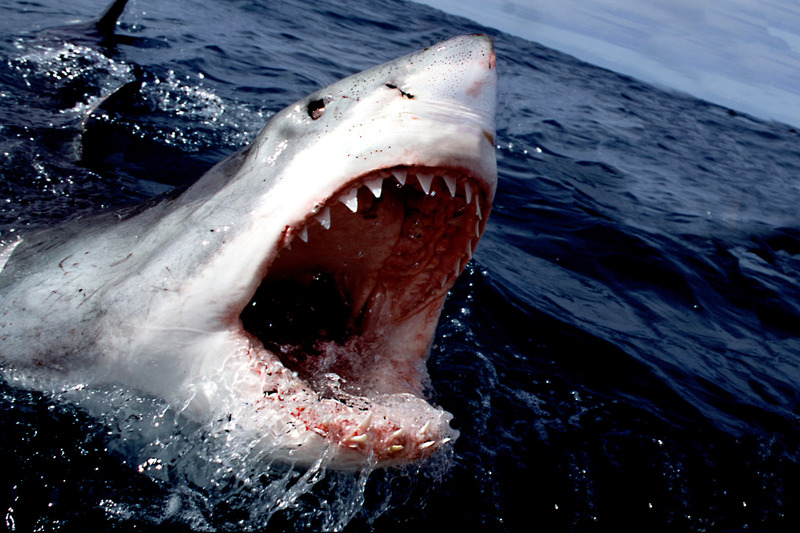 Great white sharks have the perception of being ruthless killers when in fact they are rather intelligent and curious – that’s why many surfers are mistaken for seals. The intelligence of great whites becomes apparent through various behaviours they exhibit, especially when swimming in groups. To communicate with one another, sharks may often be found swimming open-mouthed or asserting their presence with mighty body slams. The brain of the great white works like a well-oiled machine, coordinating all their senses so that they may outsmart even the wittiest of sea animals such as dolphins and seals – which are the animals that they hunt. When prey becomes scarce, some may migrate to warmer waters to feed, such as one shark, who swam all the way from South Africa to Australia; the longest documented journey made by any fish. Witness the intelligence and predatory skills of great white sharks by immersing yourself in their environment when you go shark cage diving. That’s cleared my thoughts. Thanks for coniributtng.